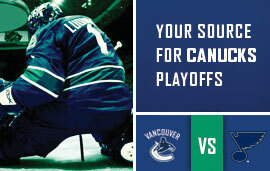 As the Canucks get set to embark on their first postseason in two years, you’ve undoubtedly heard a lot of talk about Vancouver’s first round match up with St Louis. There’s discussion about the head-to-head meetings during the season, opinions on which team is hotter heading into the playoffs and people are tossing around numbers like a grade 12 math teacher on Red Bull. So rather than tell you which defenseman has the best plus/minus on weekdays in months that begin with vowels, here’s a few connections between the Canucks and Blues as they get set to tangle for the third time in the postseason. Jeff Scott Rintoul is a host of the BMac and Rintoul show on the Team 1040 broadcaster in the mornings starting at 6am. How will Mats measure up? This is the most obvious connection out there, so why not start with it? You may be well aware that Ryan Johnson wore the Blues’ sweater for the past five seasons prior to joining the Canucks last summer, but don’t forget about Mike Weaver. The current Blues’ blue liner played 55 games for Vancouver last season, and captained the winning team at the Canucks’ skills competition in ‘07-08. 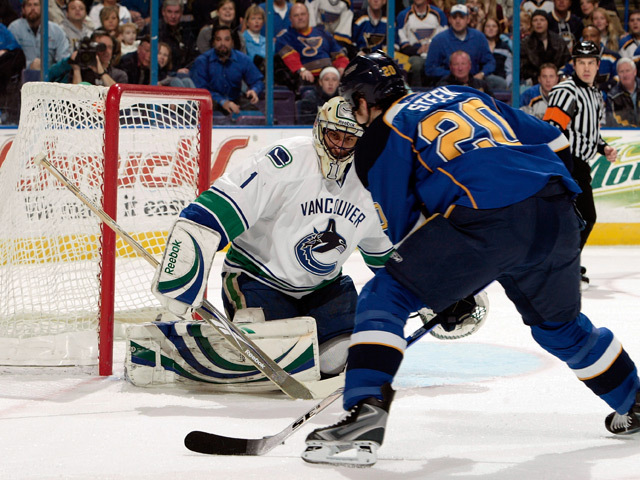 Canucks’ winger Pavol Demitra also qualifies in this category, as the skilled Slovak was a member of the flu-ridden Blues’ bunch that saw a 3-1 series lead evaporate against Vancouver in the first round of the 2002-03 playoffs. Another member of that St. Louis’ squad six years ago now finds himself in the employ of the franchise that sent him to the golf course earlier than anticipated. Despite registering just a single assist in that series, Scott Mellanby was a very prominent member of the Blues, but now scouts for the Canucks after being hired by Mike Gillis last summer. No member of the organization knows this year’s Blues better than Mellanby, who still resides in the St Louis area with his family. Blues bench boss Andy Murray has never coached Canucks’ speedster Mason Raymond, but the two could be breaking bread at a family gathering over the summer. Stay with me on this one – Murray’s cousin is the mother of Raymond’s wife. As a result, Murray has admitted to keeping an eye on how Raymond is doing with the Canucks, and says he wishes him well… for the most part. “I love it when Mason scores and we win,” quipped Murray earlier this week. Had things turned out a little bit differently last summer, David Backes could be lacing ‘em up for the Canucks in this series instead of the Blues. Vancouver GM Mike Gillis and his staff were so impressed with Backes that they extended an offer to the restricted free agent last July. 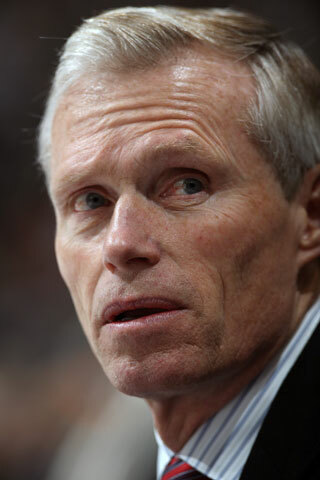 John Davidson and the Blues quickly matched the offer and then proved that turnabout is fair play by presenting Steve Bernier with a contract despite the fact that Vancouver had just traded for him. The Canucks exercised their right to match that offer, and signed Bernier to a one-year deal worth $2.5 million – the exact same yearly salary that Gillis had offered Backes. 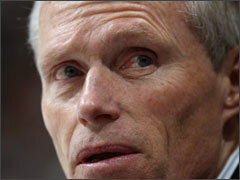 Come to think of it, have Backes and Bernier taken Gillis and Davidson out for lunch? You may never have heard of Cary Eades, but he has a very interesting connection to this series. 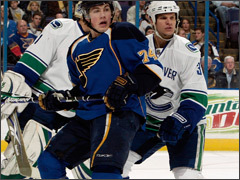 Eades coached Blues’ rookie sensation TJ Oshie in both high school and university at Warroad, Minnesota and the University of North Dakota respectively. 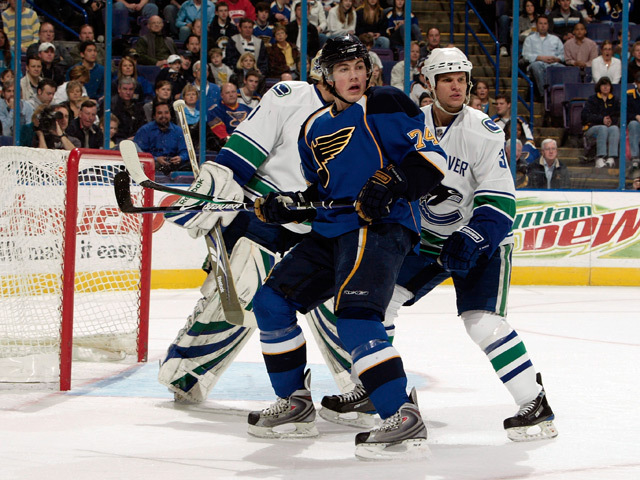 He was also drafted by St Louis back in his playing days, which would lead you to believe he’s pulling for the Blues. However, back in 1981-82, Eades played with the CHL’s Salt Lake Golden Eagles where he was a teammate of Canucks’ coach Alain Vigneault. So where does his loyalty lie? Given the fact that he grew up in Burnaby and played his minor hockey in the lower mainland, Eades admits that he’s a lifelong Canucks fan.